Experience multiple island highlights in one day on this Cozumel day trip that includes round-trip ferry transportation from Playa del Carmen. 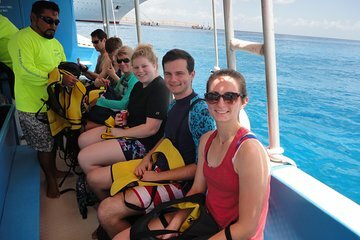 Board a glass bottom boat and enjoy easy transportation to shallow underwater reefs, stopping to snorkel and see colorful tropical fish and maybe sea turtles or stingrays. This leaves enough time for lunch and a short walking tour of the island. We had a great adventure. Julian and Miguel were great!! Two of us stayed on the boat and two snorkeled. All had a great time, even the one scared of fish. The guys were informative and entertaining. Carlos was a great captain. America and Arturo were very helpful with organizing everything on land.